Exploration and never-ending dreaming was the leading inspiration for humans to get up in space. Four hundred years ago, no one could have probably imagined that one day humans will step on the moon’s surface. Also, nobody would have known that we will be able to look back in time. Today, spacecraft are no longer only a topic of science fiction. They help us to explore our universe and maybe one day they will help us to discover some new worlds. So, a spaceship tattoo is a perfect choice if you are keen on cosmos-related or sci-fi things. Also, if you are a person who loves to explore and dream about the universe – check out other cosmos-related tattoos such as the galaxy, astronaut or simple space. But if you are looking for spaceship tattoos, we invite you to stay here for a while. 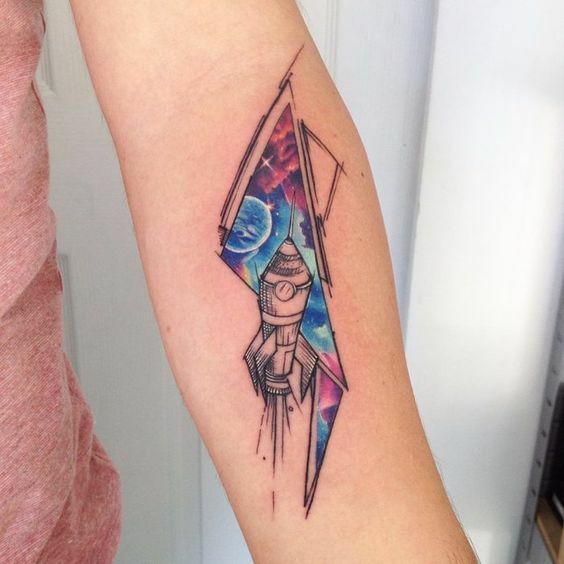 We have gathered a beautiful collection of various spacecraft tattoos, so we are sure that you will find the perfect idea right here! Since the ancient times, people tried to reach the sky and look beyond. It took thousands of years of developing various machines until we finally built the first manned spacecraft. In the past seventy years, we made a breakthrough in cosmic exploration. And finally, in 1961, Yury Gagarin completed a full orbit with Vostok 1 around the earth and returned home. Since then, humans made some fantastic discoveries in the cosmos. Spacecraft not only allows us to explore our universe, but they also help us down here on earth. Satellites provide us with GPS, television and many other technologies. Thanks to the satellite technologies, we can track down the criminals, find a place in a foreign town, and predict the weather. But the primary purpose of the spaceship has always been to reach the distant places. So far, we have only visited the moon, but we are planning to go to the Mars in the next decade. So, with this in mind, a spaceship is an ultimate symbol of space exploration. If you like to discover new things and dream about cosmos – it’s a perfect choice. Another symbol of a spaceship is the progress of the humanity. We don’t have any better technology that could take us to the moon or Mars. Until today, we rely only on fuel-based rockets and spacecraft that uses the gravity of the planets as a slingshot to go further. We don’t know what the future of space exploration holds for us. But the spaceships will probably be the primary tool for quite a long time. In real life, there are eight main types of different spacecraft! Right now, there is only one manned spaceship orbiting the earth – The International Space Station. But there are thousands of satellites around our orbit, and a few spacecraft flying into other planets. However, thanks to the sci-fi, we have many drawings and concepts of fantastic spaceships that may someday become very real. Basically, every machine that flies in outer space is a spaceship. Rockets, probes, satellites, spaceplanes, command modules and even telescopes – all fall under the spacecraft category. Take a look at the examples below and pick the one you like the most. Another micro rocket tattoo on the ankle. As for the placement and size of spaceship tattoos, we recommend small or medium designs. The most popular placements are ankle, wrist, and chest. For inspiration, take a look at our collection of spaceships below. If you can’t find the one you like – don’t rush. Take your time to look for more ideas, and don’t be afraid to experiment.